Time to breakout your sweaters, it is going to be windy and cold along the river communities. The National Weather Service in Las Vegas is reporting wind gusts between 20-30 miles per hour with temperatures dipping below freezing in parts of Mohave County over the next four days. Along the river, temperatures during the day will be around 60 degrees with overnight temps around 45 degrees. On Friday, Nov. 18, temperatures will hit about 70 degrees for the day and lows around 47 degrees. Winds will hang around for another day with wind gusts up to 20 miles per hour. For those in the higher elevations, expect freezing overnight and a high in the 50’s during the day. 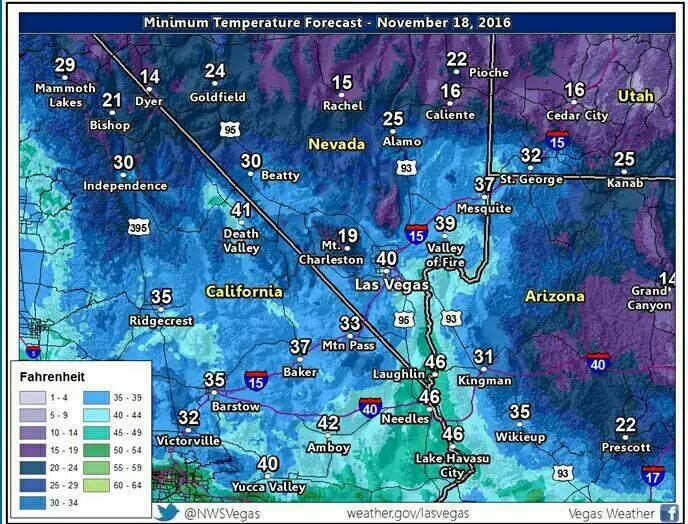 The NWS chart shows Kingman at 31 degrees tonight and has issued a freeze warning for that area. Remember to take precaution with pets and plants during freezing temperatures. On Saturday, the high is expected to be about 75 degrees with a low of 53; and on Sunday, the high will be around 79 degrees during the day and 57 degrees at night. We will keep you updated with any weather changes.